I’ve often heard that breakfast is the most important meal of the day. It is recommended that you start the day off right (read: not with an unhealthy muffin or donut). Pastry times have changed. 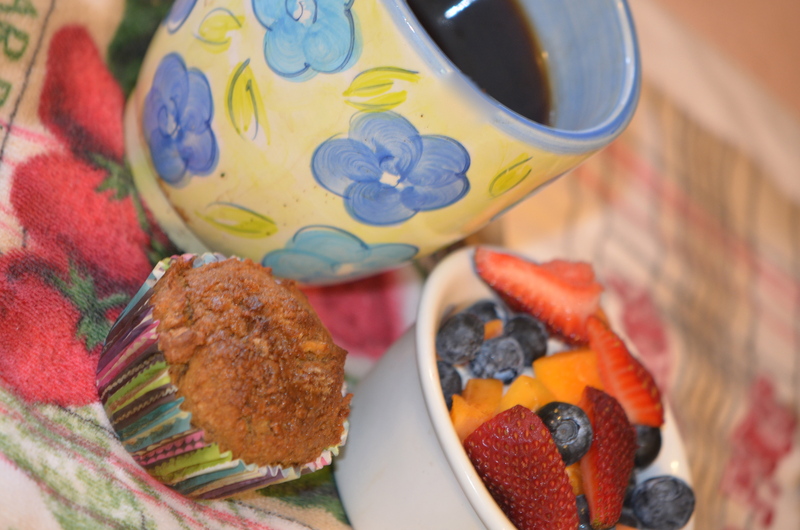 Now, it’s easy to bake muffins that are completely whole grain, high in fiber and protein and very low in sugar and fat. Oh, and they taste fantastic! Maybe even better than a standard, nutritionless muffin, which induce a huge sugar low an hour or so after eating. Did I mention this fruit- and veggie-packed treat is gluten-free? The recipe for cinnamon apple power muffins makes 21 big, soft and slightly sweet muffins. The taste is nutty from the quinoa flour and pecans and wholesome and hearty from the oats. My favorite flavor aspects are sweet, tropical and vibrant notes from the coconut flour and final dusting of coconut palm sugar, along with a light, clean essence of agave nectar. This portion-sized cake itself is filling and hearty. I like to split a muffin in half, toast it and spread on a bit of a light, trans-fat/dairy free buttery spread. When paired with hot coffee and Greek yogurt topped with fresh fruit and a drizzle of honey, you will feel content and energetic all morning long. 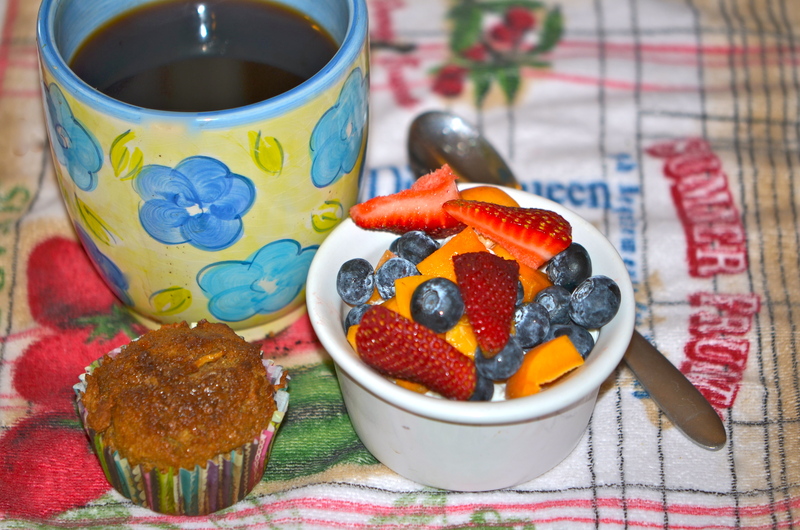 After baking these muffins, even a broken coffee pot couldn’t stand in the way of a nutritious, sweet morning treat eaten alongside a steaming cup o’ Joe. Where there’s a will, there is a way as far as my coffee and an sunrise nosh are concerned! Freeze any remaining of the 21 muffins for a quick, healthful and satisfying breakfast the whole family will enjoy. My two little ones love these muffins! The Little Guy is convinced the raisins are chocolate chips, and I will not ruin his gorgeous vision. Seriously, though, I can totally see myself adding chopped, 73% dark chocolate to the batter! Makes 21 Big, Bad Muffins! Mix the dry and wet ingredients in separate bowls, then combine just until well-mixed. If the mixture looks very dry, add up to 1/4 cup additional almond milk. If the mixture looks very wet, add up to 1/4 cup additional flour of choice. Most gluten-free seed and nut flour varies in absorption of liquid, which is why this step is necessary. Preheat oven to 350•F and line 21 standard cupcake tins with lines, almost two pans total. 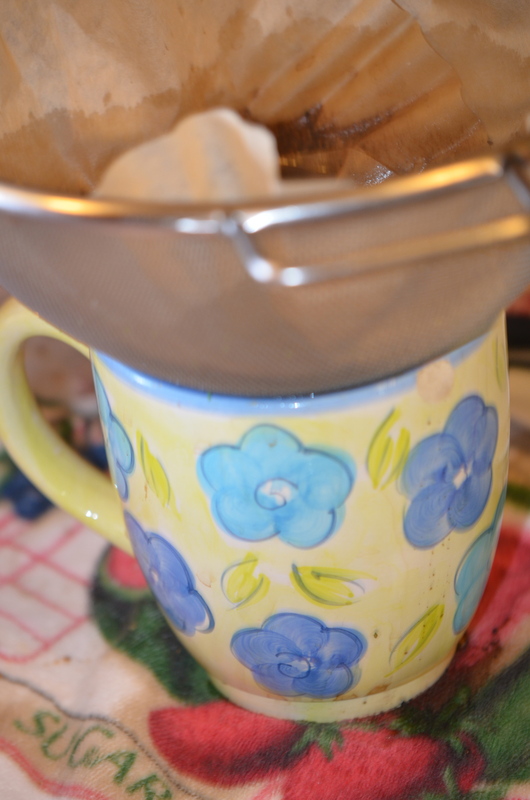 Use an ice cream scoop to place one scoop of muffin mix in each liner. Sprinkle 1/4 teaspoon coconut palm sugar on the top of each muffin. Bake on center oven rack for 25-35 minutes, until the muffins are completely cooked and a toothpick comes out absolutely clean. Gluten-free muffins may take longer to bake. Allow muffins to sit in pan for ten minutes. Allow muffins to cool completely on wire racks before enjoying. 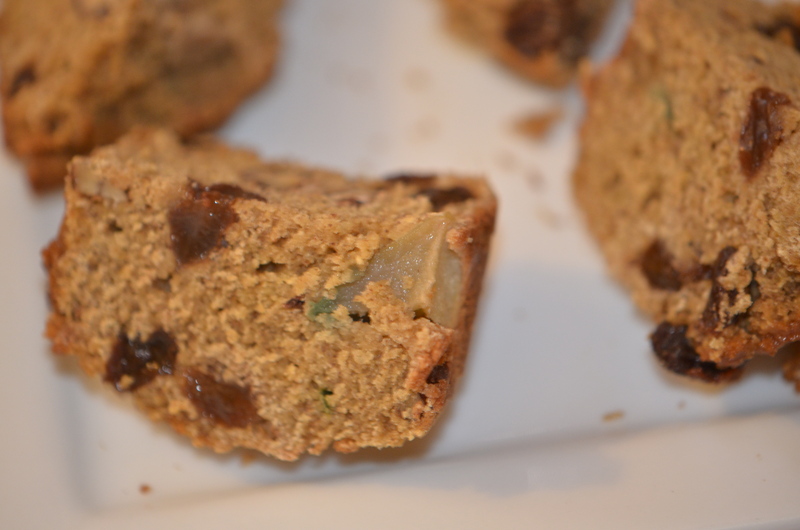 Posted in Gluten-Free, Healthy + Sweet Treats, lactose-freeTagged agave nectar, apple, coconut flour, coconut oil, Dairy-Free, gluten-free, Healthy, lactose-free, Light, Muffin, oat flour, pecan, quinoa flourBookmark the permalink. Look at you go, Shanna! All the way down to nutritional facts. Are you considering nutrition as a future occupation? Thanks, Janet. To be a nutritionist, I would need a completely new bachelors degree and then pursue another masters. Probably not. I do love learning about the subject, though, and sharing my tidbits of knowledge with others! 🙂 Thanks for the visit, amiga. Collecting all tha info is such hard work. Snaps for you supplying the info. A big thank you from the rest of us! Haha, Merril. Thanks for the warm words, my friend. Looks good – and the candy striped cases are very pretty. Gracias, Denise! 🙂 It looks like you’ve done some great reading lately; thanks for sharing. Sounds so yummy! I do so enjoy a muffin, especially when it actually has useful nutrition in it! My kiddos would be all over these as well. The muffins look delicious. Your inventiveness in getting your morning coffee is impressive. Thank you, Darryl. I am nothing if not resourceful. Enjoy your weekend with your lovely family. 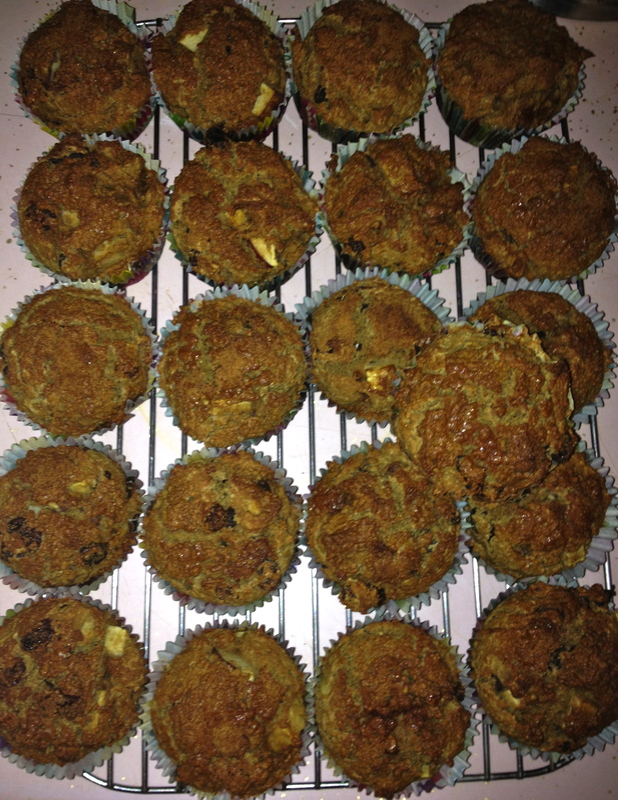 Woah muffins looks delicious, perfect ,healthy with nutritional values. …g8…. Thanks, Liz. Your recipes are in my Facebook feed and they always look so colorful and flavorful. Your cooking continues to evolve. Keep it up, Chef. 😉 Cheers! Your muffins look great, and apple-cinnamon is one of my favorite kinds. Do you ever do any traditional baking or is it always gluten free, butter free, etc.? Thanks, Stefan. I very much enjoy traditional baking. It is a true science and challenge, with great results when a dish turns out well. European pastries are amazing and a favorite to enjoy, though often difficult for me to make with great results. More practice is needed! I enjoy experimenting with recipes for muffins, cookies, etc. made with healthful ingredients and whole foods because: a.) my kids are sweet treat monsters and always have their hand in the cookie jar and b.) my husband works long hours and has little time for exercise, plus consumes a lot of crap food at the hospital cafeteria, filled with added sugar and “bad” fats. You are what you eat! Part of the reason I enjoy your blog is that it is traditional, yet fresh, unique and experimental in nature! Terrific recipe, Shanna. They really do look so packed with goodness, how can you pass one up for breakfast? Love all the hearty oat and quinoa flour your recipe calls for. Hope all is well! I’ve never used quinoa flour but I really like the idea of adding a protein rich flour to my baking. It helps to stabilise blood sugar even more. So win win! I remember all too well those “old” muffins. Sure, some may have had some bran flakes but they all had more calories than many a lunch. And we thought we were eating healthy. Ha! Not the case with your muffins, though, Shanna. These are the real deal. Thanks for sharing. I love muffins and i love the flours you used in these. Such great flavor combos too. Delicious! did you grind them by yourself or buying the ready to use ones??? this muffin must be delicious…..